Country Square Western Wear is considered to be one of the best in the western wear business. The quality of our cowboy boots and cowgirl boots exceeds the expectations of Puyallup customers. Our finest leather and a variety of designs for many occasions make our western wear a popular brand in Puyallup, WA. Our western products are widely acknowledged in Puyallup for innovation, quality and durability. We have been working since 1986 and keep alive the classical traditions of western wear. Our western wear products, such as cowgirl boots, are a blend of old and modern styles. Cowgirl boots are not only designed to ride a horse but also ideal for parties and social rendezvous. Many cowgirl boots designs present quite a modern look for western boots. These are some of our cowgirl boots or western boots for various purposes. 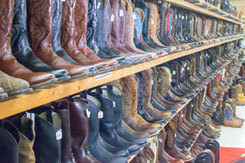 We offer a wide range of western boots in the Puyallup area. These are available for Puyallup men, women and children. Different styles of cowboy boots and cowgirl boots offer divergent benefits; for example, Abilene western boots are designed for hot weather to resist foot odor. Our western boots are specially made to guarantee both durability and comfort. The genuine leather makes them oil resistant. These are some of the name and qualities of our western boots products. If you are looking for western boots, cowgirl boots or cowboy boots in the Puyallup area, we are available seven days a week to serve your western boots needs. Puyallup women, men, and children will most definitely find a large variety of cowgirl boots and cowboy boots at Country Square Western Wear.